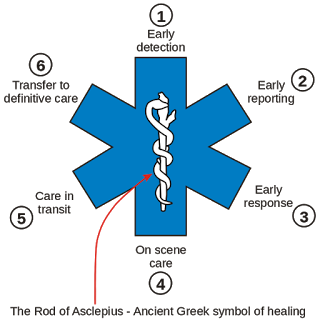 The Star of Life is a blue, six-pointed star, outlined with a white border which features the rod of Asclepius in the center. The origin and design is governed by the U.S. National Highway Traffic Safety Administration (NHTSA) which is under the United States Department of Transportation, DOT). Internationally, it represents emergency medical services units and personnel. The logo was used as a stamp of authentication or certification for ambulances, emergency medical technicians, advance emergency medical technicians, paramedics and other emergency medical responders. However, it is now use Internationally to represent emergency medical services units and personnel. 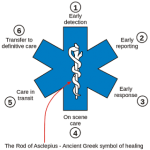 The Star of Life was created after the American Red Cross complained in 1973 since most ambulances used a safety orange cross on a square background of reflectorized white to designate them as emergency units. The orange cross too closely resembled their logo, the red cross on a white background, its use restricted by the Geneva Conventions. The newly designed Star of Life was adapted from the Medical Identification Symbol of the American Medical Association, which was trademarked by the American Medical Association (AMA) in 1967. The newly designed logo was trademarked on February 1, 1977 with the Commissioner of Patents and Trade-marks in the name of the National Highway Traffic Safety and Administration. The logo was “given” to the National Registry of Emergency Medical Technicians (NREMT) for use as the emergency medical technicians (EMT) logo after the trademark expired in 1997. From there, the logo was carried on and now are being utilized worldwide by emergency medical services and personnel. It has become an identifiable mark for rescuers and emergency providers even the form of a badge or a patch. 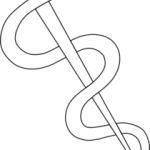 The Rod of Asclepius also known as the Staff of Asclepius is a serpent-entwined rod wielded by the Greek god Asclepius, a deity associated with healing and medicine. There were several theories with respect to the symbol but most of these can be traced to Greek mythology. 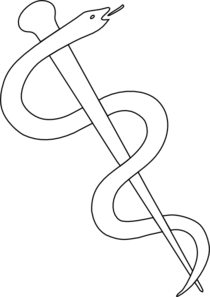 The symbol has continued to be used in modern times, where it is associated with medicine and health care. Medical doctors, nurses, emergency medical technicians, paramedics and even first aid providers proudly wear the symbol as an identification of their work or profession. There are six points or shall we say six branches in the star of life. Each point represent the task that a provider execute during the whole response. Detection: The first rescuers on the scene, usually untrained civilians or those involved in the incident, observe the scene, understand the problem, identify the dangers to themselves and the others, and take appropriate measures to ensure their safety on the scene (environmental, electricity, chemicals, radiation, etc.). Reporting: The call for professional help is made and dispatch is connected with the victims, providing emergency medical dispatch. Most countries have a 3 digit number for their emergency medical services. The dispatcher usually decides and dispatch the necessary vehicles and personnel toward the scene basing on the report. Response: The first rescuers provide first aid and immediate care to the extent of their capabilities. They also decide if additional resources are needed at the scene and may call for them. On scene care: The EMS personnel arrive and provide immediate care to the extent of their capabilities on-scene. This includes assessment and prioritizing care such as airway management and controlling bleeding. Vitals signs will also be taken to have a baseline data of the victim or victims condition and also provides the necessary intervention for the patient to survive. Care in transit: The EMS personnel proceed to transfer the patient to a hospital via an ambulance or helicopter for specialized care. They provide medical care during the transportation. Transfer to definitive care: Appropriate specialized care is provided at the hospital depending on the nature of injury or illness. Don’t wear it unless you understand….. There is no agency tasked with enforcing its use as a mark of certification, the Star of Life has traditionally been used as a means of identification for medical personnel, equipment, and vehicles. Many ambulance services mark the symbol on their vehicles, and ambulance crews often wear the design as part of their uniform. It is quite interesting to know the meaning of what your wearing. So before you wear the patch or your pin, you should be able to know the meaning of the symbol. By knowing the meaning, we can be assured that you you also know your job. Then and then only you will be worthy of wearing the symbol we call the Star of Life….. This entry was posted in General Discussions on August 2, 2016 by basiclifesaving.